I have nothing to do with this project (haven't even pledged yet) - I saw this today on Battlegrip.com and knew the rest of the LRGers needed to know about this amazing project! It's hard to gauge the scale of these, but judging from the Kickstarter page, these are very much in the vein of our beloved MUSCLEs. It appears they've tried to replicate the rubber as well - the texture of the prototypes above looks spot on. We've got 59 days remaining to raise the capital to make this happen - it only takes $10 to secure a set of 5 OMFG! toys.. lets help make these awesome toys exist! Link to original thread @ Octobertoys forum. Incidentally, these are the same guys behind the amazing ZOMBIE minifigs - a must-own for MUSCLE fans! 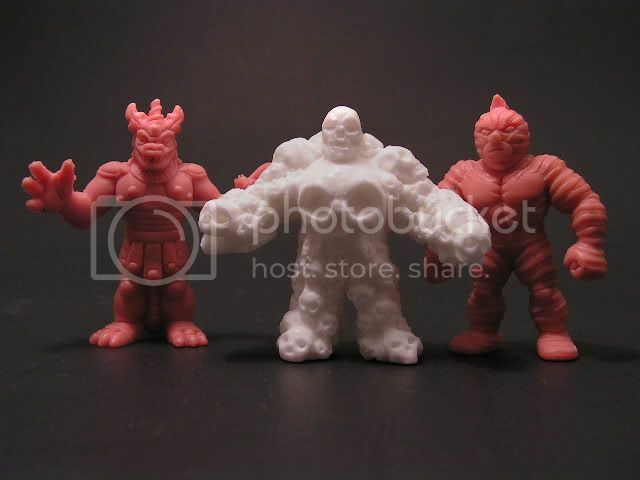 Interests:Battle Beasts, Glyos, and Other Little Rubber Guys. Oh, and Geocaching! Hey guys! Just wanted to pop over here and let you know about a new line of minifigs inspired by muscle and other little rubber guys. The line is called OMFG! Or Outlandish Mini Figure Guys and will be a full production line. This line has been a long time in the making. It started with a love of minifigures of all types. Many of us from around the world on the October Toys forum brainstormed the idea, came up with 40+ design, voted on the ones we like, and designed the graphics for it. This is very much a fan driven project. If the first series is successful, it will continue to move on to series two and so on where everyone can input their designs and ideas. This will always be a fan driven project. Here's where we come in. Since it's fan driven, it will also be fan funded. We have started a Kickstarter page to help fund this. Check out the link, watch the video, and see if this interests you. Thanks for your time! Edited by MindlessFocus, 12 June 2011 - 08:23 AM. Heheh.. I just started another topic about this awesome project a short while ago.. perhaps a mod can merge the two? Regardless, it's very OK to post this sort of thing here - these guys look amazing! I'm going to be pledging; not sure if I can scrape together enough to get the exclusive black fig's too, but I'll certainly try. I really hope that enough investors pledge for this project to be funded! Edited by SpectreSuperSix5, 12 June 2011 - 10:24 AM. NOTE: The white Multiskull is a prototype that goes to the factory. Edited by MindlessFocus, 12 June 2011 - 08:59 AM. See my post in the Muscle forum for scale. Very creative figures! I like the skull and the outhouse figures. What happens to our money if the $11,000 isn't met? Do we get what we paid for, or do we get our money back? Edited by vette88, 12 June 2011 - 03:41 PM. Edited by MindlessFocus, 12 June 2011 - 09:29 AM. Ok, hope it hits $11,000. Killer concept, and killer pricing, if it goes through! Between this and the other custom figure launch, this is going to be a banner year for MUSCLE like figures! "Not another toy line to collect"
Someone has finally done it,M.U.S.C.L.E. meets MIMP toy line. guys so it could be added to the OMFG line,it would fit in really well. I want a furry Cyclops. it aged just as badly as those English chaps . Cool figs! They have a Necros Fortress look. I really dig the skull guy. Glad you posted it, nice to see Oct toys over here too. I read all about it over there. I want some!!! very cool. i'll pledge as soon as i can. Just remember, you don't get charged today but only at the 60 day mark IF we hit 100% or $11k. I would be happy to promote this on my blog. Do you take pledges/orders from Japan? Yes we do. Just note the international shipping note in parenthesis on each pledge. Those are neat, I especially like the skull one and the outhouse one. I'm Coo-Coo for customs! These are sweet. Interesting pledge concept. I have not been burned on LRG yet so I don't have a fear of losing my money. I'm in....I'll be pledging. Hope everybody does so we can see this happen. One day and they are almost a quarter way there. I sent an email to the guy over at BBTS who bought most of my store stock back in 2009. Hopefully they take an interest!